With Capt. Smith seconded to the 5 th Army in Italy, I was then appointed to Command 104 section SWS. “As June approached we moved to our operational site in England – The Carpenters Arms at Rustington, West Sussex. There we had to learn to waterproof our vehicles – in the sure knowledge that we would be landing from beach-craft into several feet of water. This involved waxing all vulnerable parts of all engines and fitting two long, small bore vertical tubes, one for the air-intake, and one for the exhaust”. Practice runs were made by driving the vehicles through the pond that was in the grounds of the home, however not always with success and there was the constant fear that the vehicles and men may be left stranded on the beach at the mercy of enemy artillery and aircraft. “We stayed at Rustington to cover the D-Day landings and we had a grandstand view of the commandoes and paratroop gliders and aircraft on the evening prior to D-Day. On the day itself we were able to report the Germans disbelief in the early stages that this was the real invasion. Having proved our assistance to our assault troops, it was out turn to join them and we left Rustington for a marshalling camp on Wanstead Flats in Epping Forest, East London, before moving onto Victoria Docks where we were loaded onto the SS.Stanridge. However they weren't the first Special Wireless Section to be billeted at the Carpenter Arms! – Since January, the 108 SWS under the charge of Major Rowley and Capt. Gentle, (operating ten intercept sets and one Direction Finder) were billeted there with a detachment of Canadian operators who were attached for training purposes to the unit. An operator adds “the carpenter's arms were the best – we had a bar, comfortable beds – we wanted for nothing” they found themselves for once surrounded by luxuries many had never experienced. A bar with an abundance of spirits and alcohol, grand rooms with comfortable beds, a well-stocked kitchen and a sea-side setting! – recent research has shown that there never was a Carpenters Arms In or around the Rustington Area….Yet two separate accounts state its existence! - a local resident and curator of the Rustington Museum(Mary Taylor) takes up the story…. There was never a public house in or around Rustingon called the Carpenters Arms, however there was a building in Rustington called The Carpenters, it no longer goes by that name as it is now convalescent home along Rustington Seafront. 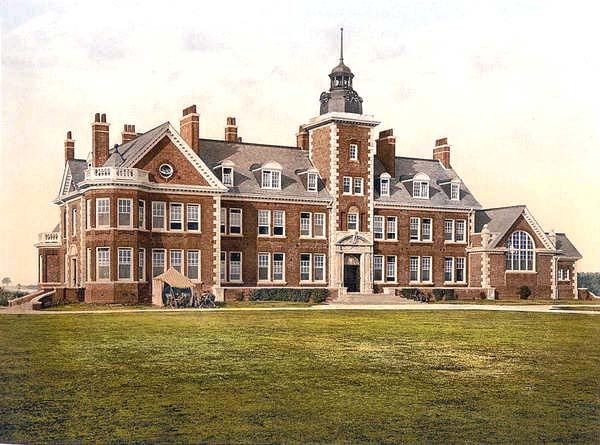 It is a beautiful large listed grade two building, standing in its own large grounds; I will give you a brief history of this building. 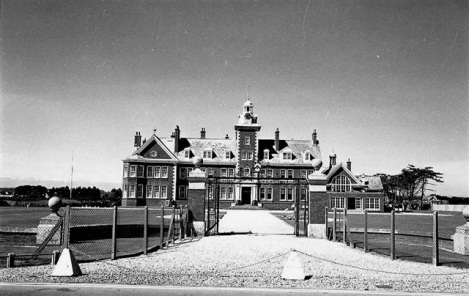 The Rustington Convalescent Home was founded and endowed by Sir Henry Harben (1823-1911), Chairman of the Prudential Assurance Company and Master of The Carpenters Company in 1893. Harben purchased the site in 1895, spending £50,000 on the land and the construction of the Home. A further 8 acres of farmland was purchased adjoining the site was purchased by Harben in 1898. The Home opened on 20 th March 1897 with the Company and Harben named as joint trustees. After Harben's death, the administrators of the home were wholly entrusted to the Carpenters Company, and still are. It celebrated its centenary on Tuesday 17 th June 1997. In 100 years of operation, The Carpenter's Convalescent Home has seen many changes, but importantly for this story - It was requisitioned by the War Office from 1940-1948. The large wrought iron gates at the front of the entrance have the Carpenters Arms worked in both sides of the gates. (“A felde silver a Cheveron sable grayled iii Compass of the same”.) – hence the nick-name “The Carpenters Arms” ! Mary goes on to say: “I have always lived in Rustington since 1930, I know that most of the larger houses and hotels were requisitioned by the military during the war, from Canadians, Americans latterly and many other nationalities. We had some months before D Day, groups of Special Wireless in Sea lane, and the dozens of masts were there for all to see, but Rustington was a restricted area, and special documents were needed to enter the village. I understand that it would have been a wonderful posting, as it had every facility, snooker rooms, libraries, several dining rooms, rest rooms, smoking rooms, games rooms and dozens of single bedrooms with every facility, included in the building I am sure a couple of bars.